According to a recent news article from CNN, a man was working at scrapyard when he was killed by large explosion. After an initial investigation, it has been determined the explosion was caused by a Mk 82 general purpose bomb used by the United States military, where it can be dropped by various types of aircraft. 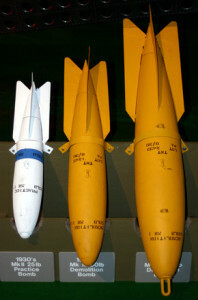 The Mk 82 bomb weighs 500lbs and is currently among the smallest non-guided aerial ordinance used in the United States military. The bomb carried a Tritonal high explosive warhead that weighs around 200 pounds. While the bomb itself is considered a “dumb” bomb, it can actually be inserted into a laser guided or GPS guided smart bomb to serve as the new weapon’s warhead. These bombs have been used for a many years, and thousands of them were dropped during the Persian Gulf War in 1991. Despite their long time in service, they are still used today, and it is unclear to authorities and the Department of Defense (DOD) how a live Mk 82 ended up in a scrapyard in Arizona. The 46-year-old metal worker was employed as a cutter whose job was to cut apart mangled metal so it could be separated, melted and sold by weight. Witnesses say that after the explosion, there was nothing paramedics could to do help the worker involved in the explosion, so the area was evacuated. The police called in their bomb squad, and the nearby air force base sent a military explosive ordinance disposal (EOD) unit to check for additional explosive devices and try to make sense of what happened. As our Boston workers’ compensation attorneys can explain, when a worker is killed on the job, filing for workers’ compensation may not seem like the first thing to do, but this is exactly what a family generally needs to do following an on-the-job death of a family member. Normally, workers’ compensation benefits are designed to assist someone who was injured on the job, but the estate of a worker killed on the job can file for workers’ compensation benefits to cover medical bills associated with workers’ final injury or illness, funeral expenses, and lost wages. The lost wages is the most substantial part of the typical workers’ compensation claim for death benefits, because the family will be left without the deceased workers’ much needed income for many years to come. In the Commonwealth of Massachusetts, death benefits awards for workers’ compensation cases can be paid in monthly installments, or the parties can reach a death benefits award settlement that involves a lump sum payment. While this may be less total money than they would get over a period of many years, many families are in desperate need of financial assistance as soon as possible and would elect to take a lump sum payment. There are advantages and disadvantages to both options, and you should discuss the facts our your actual situation with an experienced workers’ compensation attorney who regularly handles cases involving death benefits. In some cases, there can be a partial payment as a lump sum and then continued payments in monthly installments.